One doesn’t have to look far to see retail is taking in on the chin. Wikipedia has a well-sourced listicle of events in the “retail apocalypse“, as it’s been branded by the national media outlets. Several factors play into the spike in retail chain bankruptcies and closures across the country – the rise of Internet shopping (Amazon) and easy, cheap distribution, Wal-Mart and other megachains exerting economies of scale on other retailers can’t afford to sell as cheaply, younger generations buy less “stuff”, the United States simply has too much retail space. For now, some retailers are more immune than others – those who focus on convenience and budget necessities (dollar stores), those who sell goods that are hard to ship (home improvement stores, wholesale clubs), and those who focus on experiences rather than items. However, even sectors that were once seen as safe as starting to feel the pinch – pharmacies and grocery stores, for instance. With all that in mind, it seems a bit odd to be building new suburban “big-box” retail space, but Buffalo-based Benderson Development is doing just that at South Meadow Square at 742-744 South Meadow Street on the city’s southwest side. Benderson purchased the retail strip from the original developers (the Visnyei family) in 2009. 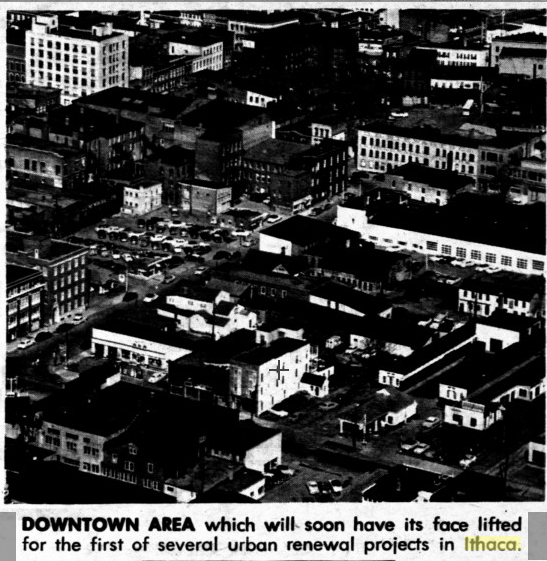 Development of Ithaca’s big-box corridor has always been contentious. Long ago, the area consisted of a few small auto-centric businesses and the county fairgrounds (hence Fairgrounds Memorial Parkway). 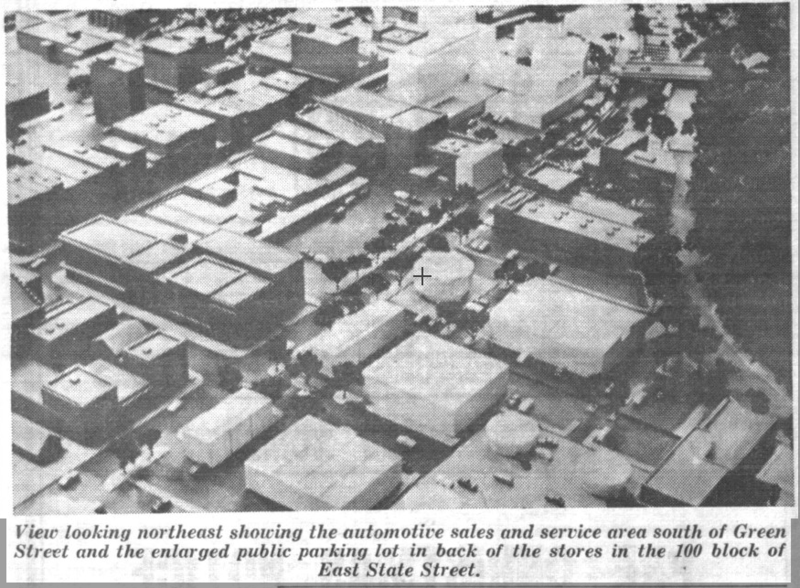 During the mid and late 20th century, big box retail slowly made its way into the southwest part of the city – what’s now Finger Lake Reuse on Old Elmira Road was built as a grocery store in the 1970s, and parts of Ithaca Plaza next door date to 1950. Wegmans opened a store in the 1980s, and replaced with newer, larger store in 1997. The 1990s was when big-box development pressure seemed to come to a head. Wal-Mart was stymied for years thanks to neighborhood opposition, and Target eventually gave up its plans and moved to Lansing. But, much to the city’s chagrin, the 1990s were difficult times economically – the tax base was in decline, state aid was in decline, and the local economy was mired in a deep recession. Somewhat begrudgingly, the Nichols (1989-1995) but especially the Cohen administration (1995-2003) began permitting large-scale retail development in the hopes of propping up the tax base and stemming the flow of dollars to suburban outlets in the suburbs, as well as Elmira and Cortland. Many of the city’s big boxes are result of that late 1990s/early 2000s wave. Wal-Mart (2005, expanded to a Supercenter in 2011), Home Depot (2003), the Tops Placa (2002). 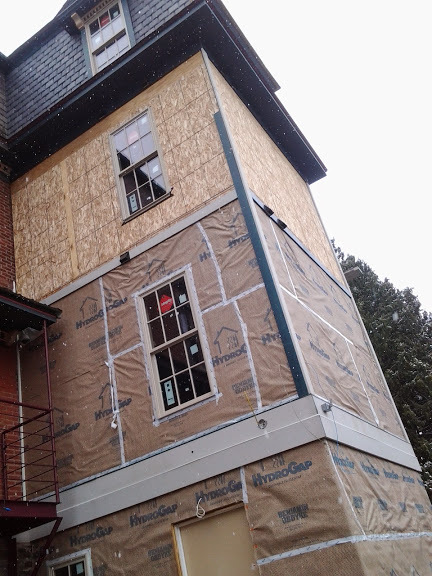 Some were all-new, others were extensive renovations and rebuilds. This particular retail strip at 742-744 is one of the latter – it had actually opened as a rather large 87,000 SF K-Mart in the 1970s (the 22,000 SF supermarket it shared a lobby with later became Staples), and was extensively renovated and in the mid-1980s and in more recent years. The K-Mart looked pretty dated when it closed in October 2011. Hobby Lobby filled some of the old K-Mart space in 2013, and in fall of that year, plans were drawn up for a pair of endcap expansions. One was on the north end – 7,315 SF of retail space, next to the early 2000s 19,000 SF PetSmart. 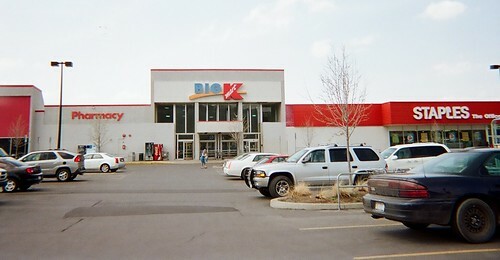 The other was a 14,744 SF south endcap that would be built were K-Mart’s garden center used to be. These plans were approved in November 2013, but then updates and revisions were proposed in 2014, when TJ Maxx and Five Below were announced to fill the remaining vacant space (21,770 SF and 8,209 SF respectively). 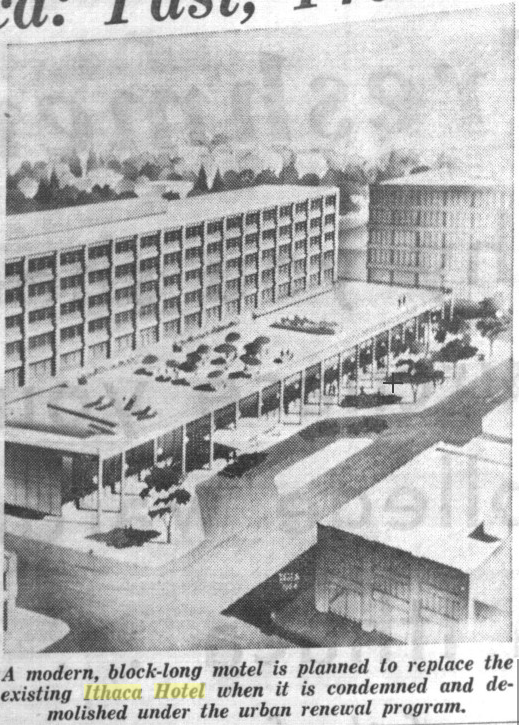 At that time, the southern addition became 16,200 SF. 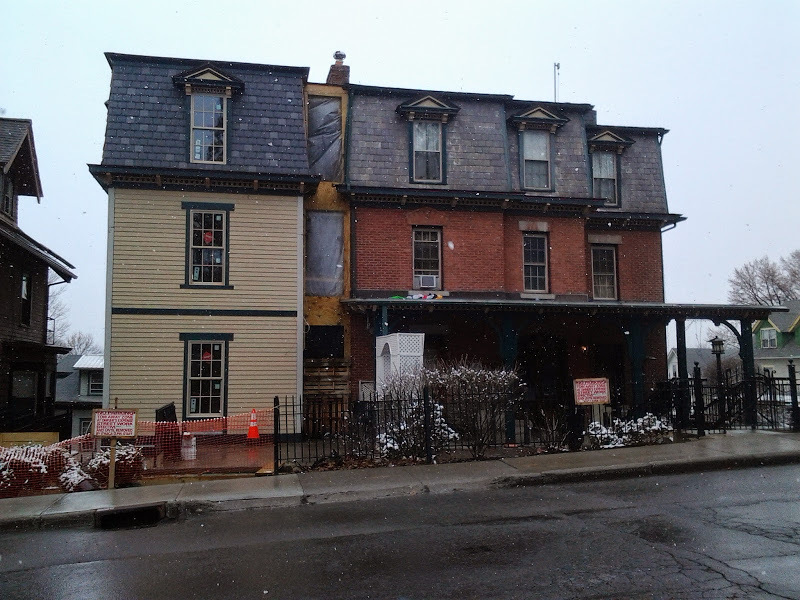 For one reason or another, Benderson decided to go back to the original plan (probably a potential tenant backed out) early last year, and asked for re-approval of the November 2013 additions – city approval is only good for two years. Unlike most parts of the city, the lack of nearby residents and general apathy towards big-box retail makes variances somewhat easier to receive; plus, a re-approval is typically a small matter – re-approval was granted in May. City zoning (SW-2, and PUDOD) is generous down here because the city keeps hoping someone will do walkable mixed-use, but the waterlogged soils make that difficult – you either build shallow, or quite deep, and quite deep requires a lot of height and square footage above ground to make up those construction costs. 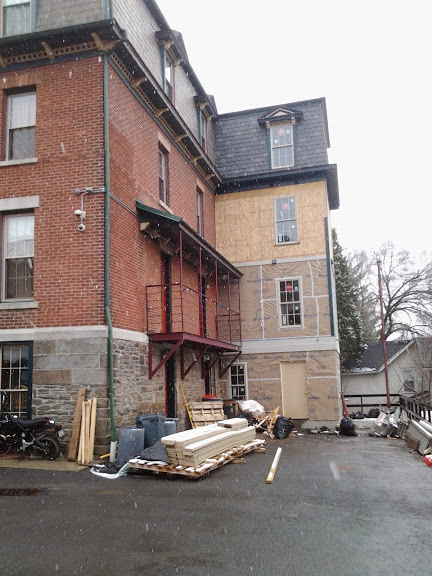 Construction is going to be fairly standard – concrete slab foundation, steel frame, masonry walls, and probably some decorative entry bays and facade work. At the moment, excavation is underway for the footers of the foundation on the southern end, while the footers have already been poured and strengthened with rebar on the northern end. The Dryvit and brick veneer on the wall of Pet-Smart has been removed, and I think that’s mineral wool insulation underneath. Expect both of these to be finished towards the end of the year. I don’t have a project value offhand, but the existing plaza (128,582 SF) is $6.5 million, so 22,059 SF of new space is probably worth about $1 million or so. As for tenants, your guess is as good as mine. We’ll see if Benderson can make it work in the age of the retail apocalypse. 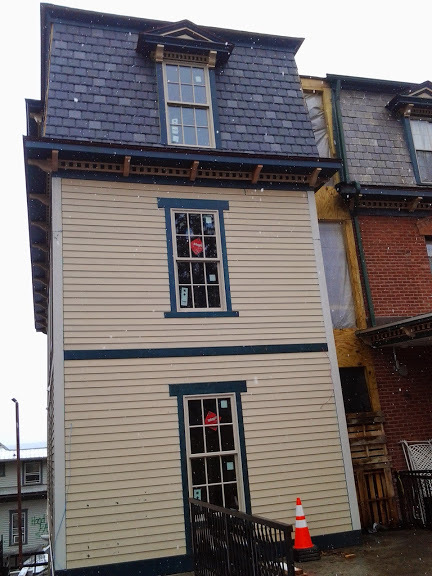 Benderson’s proffered choice of designers, Buffalo’s Carmina Wood Morris D.P.C., is the architect. West Hill is, in a sense, Ithaca’s final frontier. The least developed of the hills, it isn’t nearly as built out as South Hill or East Hill, and what is there are mostly single-family homes. For clarity’s sake, this post is about the part of West Hill within city lines. 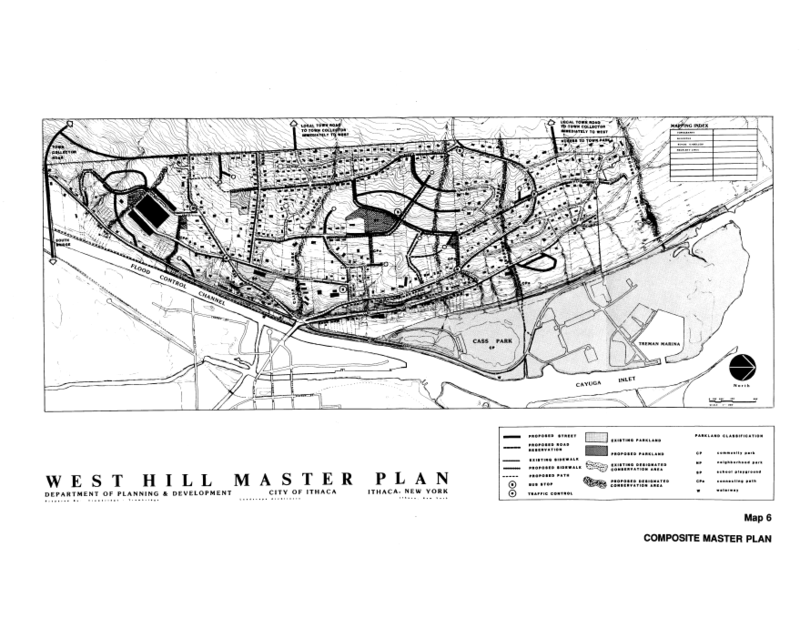 While looking up something else, I stumbled across West Hill’s Master Plan from 1992. Which, given its been over 20 years since it was written, gives an interesting perspective on how the city has wanted development on West Hill to fill out. 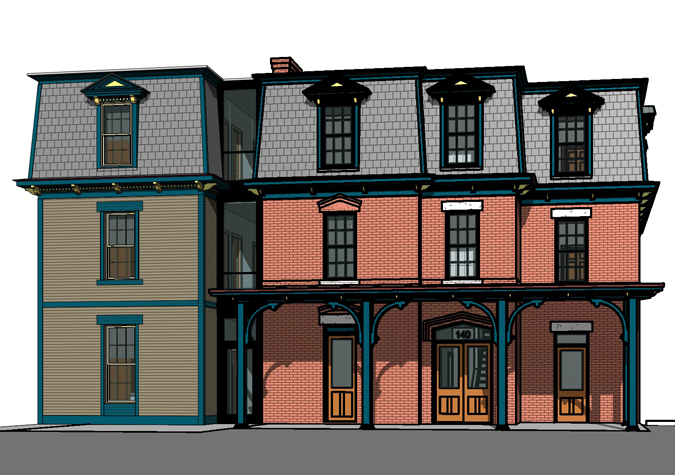 The West Hill plan was created in response to strong developer interest in West Hill sites in the late 1980s, both in Ithaca city and Ithaca town. 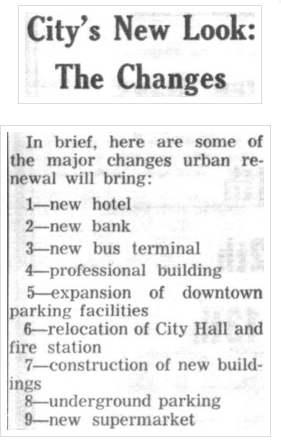 The plan notes that seven major projects were proposed during 1988 alone, in an area more accustomed to annual construction in the range of a few to several homes, and the very occasional apartment building or business. The map above shows both the current and proposed projects at the time, There were eight in total, with dozens of units and lots. It’s hard to read even when blown up, but the proposed projects, which have a heavier lot outline and blurry labels, included subdivisions for single-family housing tracts in the proposed Deer Creek, McPherson and Sunrise Terrace projects, and individual sites with multi-unit potential like INHS and Overlook Park. As seen in this 2015 map from the county, the majority of those late ’80s plans were never built, probably because the local economy tanked in the early 1990s. The four housing tracts in the middle of West Hill are still vacant today and under various private ownerships. 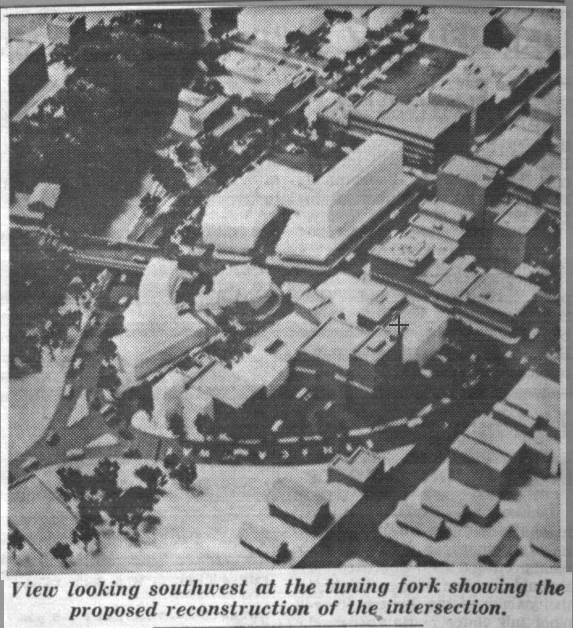 The Overlook Park site eventually morphed into the 44-unit Bella Vista proposal in the 2000s, but that project was also never built. A few plans did come to fruition, however. A site just east of West Village (380-90 Floral Avenue), called “LoPorto” on the 1992 map, became a 28-unit townhome development in 1995 that was sold to INHS five years later. The INHS site indentified in the 1992 map (310 Floral Avenue) became the 39-unit Cedar Creek Apartments in 2009, 17 years after the master plan was published. 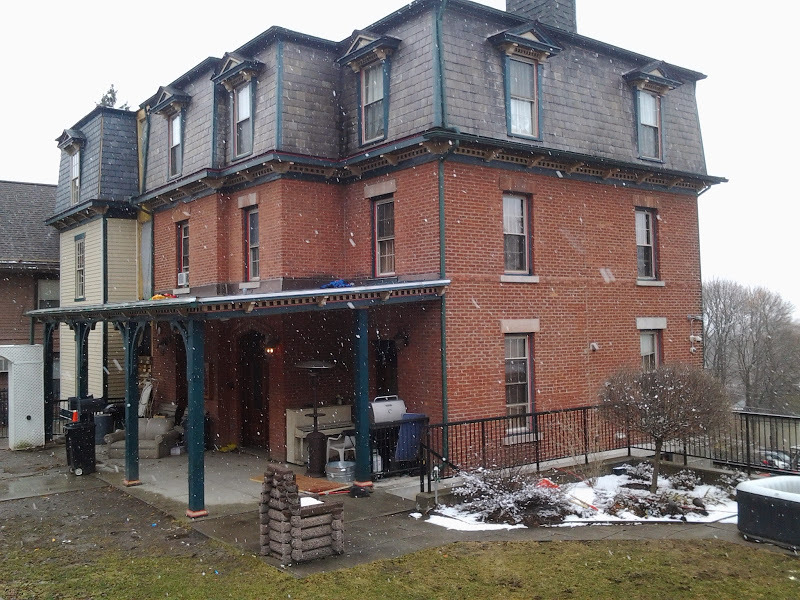 The last site, called “Clynes” after the owner, was subdivided into two lots, a currently vacant lot, and a house at 131 Haller Boulevard that was built in 1999. 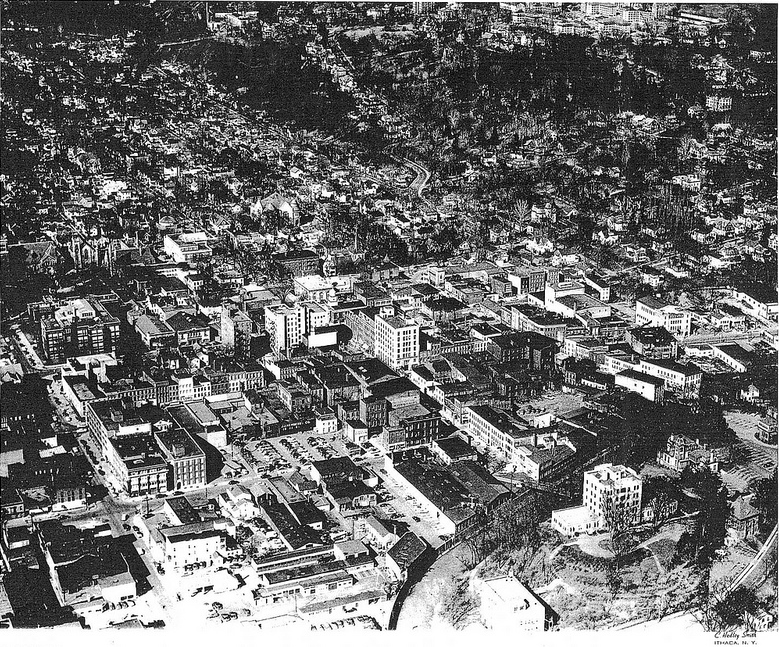 Also, note the very different street configuration over on Inlet Island – this was the time of the original Ithaca “Octopus”, a jumble of streets feeding into one bridge, and infamous for its traffic problems. 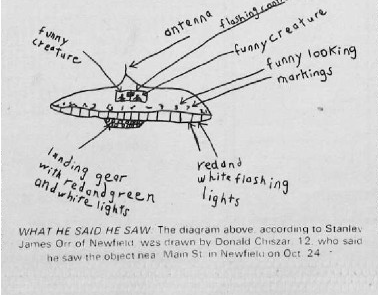 That’s a story for another day, but there are rundowns here and in a 1989 NYTimes article here. The 1992 Master Plan called for a number of new roads criss-crossing West Hill, two new parks (one by West Village, the other in the undeveloped lands in the middle of the map), and a new bridge at the southwest edge of the city. Sidewalks were recommended for the large majority of residential streets, new feeder roads would be built with Ithaca town, and Cliff Street was to be upzoned, while most of West Hill would stay the same or be downzoned to “preserve character”. 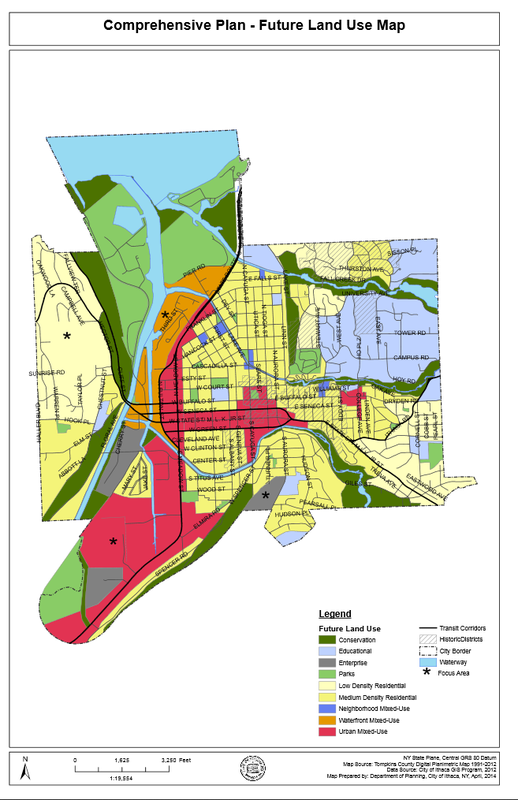 Here’s the current zoning map, but without a 1992 map it’s hard to cross-check and see what, if any zoning was changed. About the most I can ascertain is that swaths of West Hill near West Village were downzoned from R-3 to R-2 at some point. 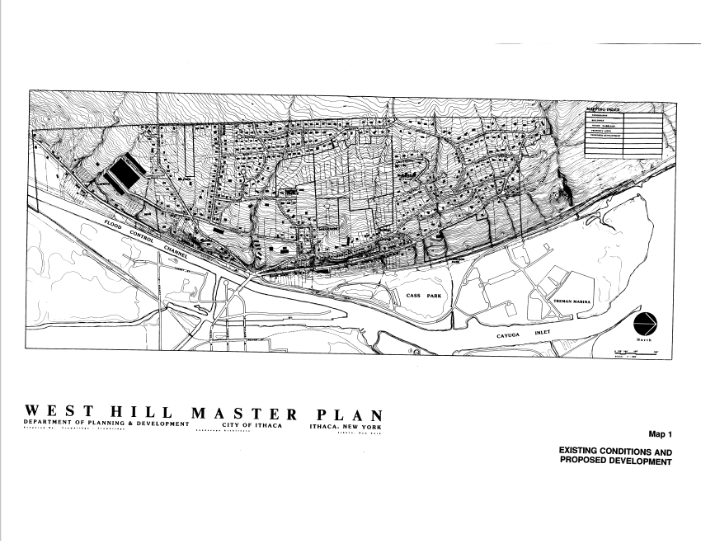 The plan also notes the abnormally large lot size used by single-family homes on West Hill, which were less dense than even the city’s lowest-level R-1 zoning; but decided it was best to keep precedent and the plan suggested narrowing all residential streets as a character-protecting and traffic calming measure. Interestingly, a number of the newly-built or currently vacant single-family lots in West Hill are recent creations from subdivisions of larger parcels by their owners. So the streets are filling in via “organic growth”. Now a look at the 2015 Comprehensive Plan. 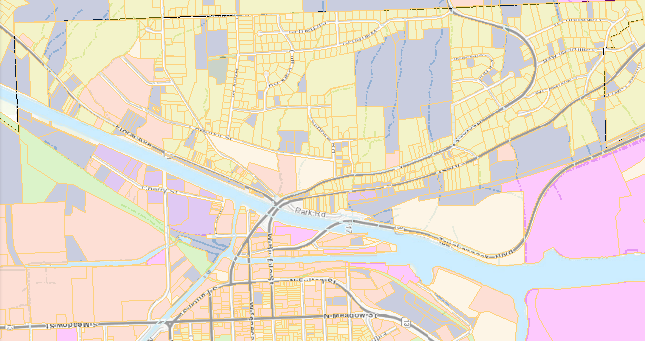 A large conservation swath (natural area with no permitted development) runs through the Floral Avenue and Cliff Street corridors, and chunks of medium density residential are put forth south of Hook Place and east of Chestnut Street. The 2015 plan notes that the undeveloped tracts in the middle of West Hill present significant opportunities for new single-family housing. The 2015 Plan notes that, just like 23 years ago, the lack of sidewalks is an issue. The cul-de-sacs, utility capacities, and “sensitivity of development to existing character” (a.k.a. be wary of neighborhood opposition) also pose issues and concerns that both existing homes and new projects need to address. Off-hand, there haven’t been any major projects announced recently in the city’s portion of West Hill, and I haven’t heard any through the rumor mill (I can think of a couple homes I’ve heard about and that’s it). But it’ll be interesting to see how West Hill evolves in the next twenty or so years.